I have for sale a restoration project- complete 1959 built 26ft. 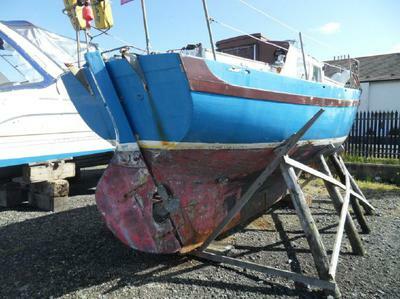 6 ton Falmouth pilot sloop-she is laying ashore at troon yacht haven north of Glasgow in Scotland. Yacht is called "Leanda"-she is complete-these were basically heavily influenced(copy dare I say!! )of a Laurent giles "virtue" class-a little roomier inside. 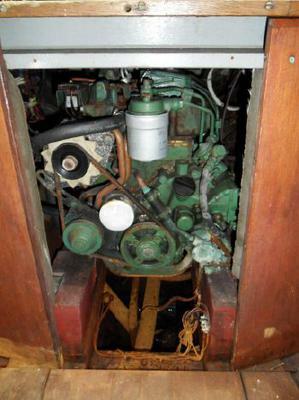 There is a fairly modern Volvo engine which turns over freely. Mast-boom-sails etc.are all there-rigging is galvanized steel and will need changing. There is rot in the sternpost and rudder-and as she has been laying for at least 2 years out of the water at troon-there will be other rot and problems needing repair. Interior is quite good-modern gas cooker with oven-sink-pressure water even!! Forepeak has 2x single bunks-and one pilot bunk in the salon. There is an anchor-winch and chain. I have more recent photos which I can send via email. my email is: captainandcook(at)Hotmail dot com. basically I want to sell "Leanda" quickly-I have another classic I am working on-and Glasgow too far away for me. The engine/gearbox unit is worth this amount!! 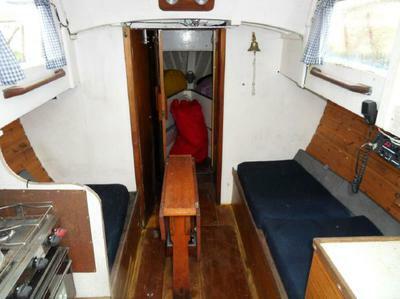 Again-the yacht is complete-needs woodwork and other restoration.